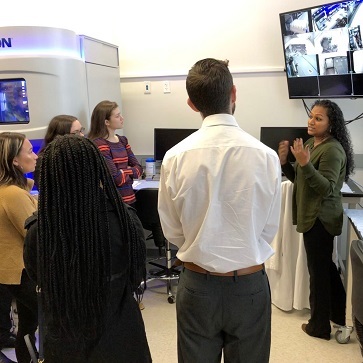 Nearly 20 biology majors from St. Thomas Aquinas College received a behind the scenes look at the extensive vaccine research and development facilities when they visited the Pfizer Pearl River site recently. They are the first college students ever to be hosted by Pfizer, where they learned about the stages of vaccine development, a typical day in the life of a scientist, and how to apply for job opportunities at Pfizer. They also received a tour of the Pfizer clinical testing laboratories and had the opportunity to meet company scientists who answered their questions. Dr. Ryan D. Wynne, Professor of Biology and Honors Program Director at St. Thomas Aquinas College who accompanied the students on their visit, later stated, "Pfizer and St. Thomas Aquinas College have a long history. So many of our students have been given the opportunity to intern with the company, and it is experiences like these that make our relationship with Pfizer so very special. Having the opportunity today to have my students visit Pfizer and see what it is like to work for a pharmaceutical company was incredible. I feel my students learned a great deal regarding what scientists in the pharmaceutical sciences do on a daily basis." Biology students at St. Thomas Aquinas College learn to apply anatomy and physiology, genetics, microbiology, and ecology to understand the world and make it a better place. Students get plenty of practice in state-of-the-art laboratories and opportunities to conduct research with world-class biology professors. The Biology program at St. Thomas Aquinas College provides a comprehensive curriculum, preparing students for a wide variety of opportunities in their professional careers. Pfizer applies science and global resources to bring therapies to people that extend and significantly improve their lives. The company strives to set the standard for quality, safety and value in the discovery, development, and manufacture of health care products. Its global portfolio includes medicines and vaccines as well as many of the world's best-known consumer health care products. For more than 150 years, Pfizer has worked to make a difference for all who rely on it. The Pearl River site in Rockland County is one of Pfizer’s nine major R&D sites and attracts scientists from around the world to do their best work. The company routinely posts information that may be important to investors on www.pfizer.com. In addition, to learn more about Pfizer, please visit www.pfizer.com and follow the company on Twitter at @Pfizer and @PfizerNews, LinkedIn, YouTube, and like them on Facebook at Facebook.com/Pfizer. St. Thomas Aquinas College is an independent liberal arts college located on 60 acres in Rockland County, NY which provides education at the undergraduate and graduate levels. The College’s 2,800 full and part-time students can choose from more than 100 different majors, minors, specializations, and dual degree programs across three Schools: Arts & Sciences, Business, and Education. The College is recognized by U.S. News & World Report in the Top-Tier for Regional Universities, by Colleges of Distinction in both its New York and Catholic editions, by Affordable Colleges Online as a top College in New York for Return on Investment, and is included as a Military Friendly School®. St. Thomas Aquinas College is accredited by the Middle States Association of Colleges and Schools; its School of Education is accredited by the Council for the Accreditation of Educator Preparation (CAEP) ; and its School of Business is accredited by the International Accreditation Council for Business Education (IACBE). For more information, visit www.stac.edu.